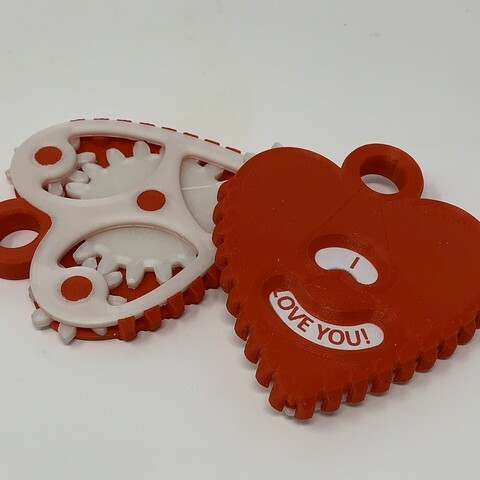 Geared Heart Message Pendant is a little late for this Valentines Day, and quite early for the next Valentines Day, in the meantime it's a great way to express your feelings to your whomever! 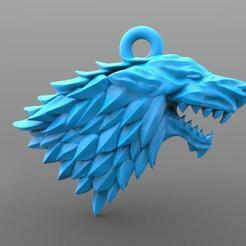 Inspired by a CAD tutorial appearing in one of my suggested video feeds (the CAD model appearing in the tutorial was quite elegant, but it was just a model and not designed for 3D printing or assembly), this model is easy to 3D print and assemble. 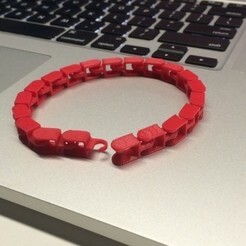 I printed one each of all 3D printed parts at .1mm layer height with 50% infill. 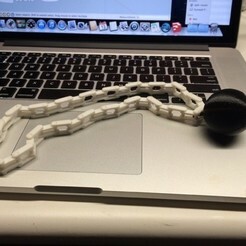 Prior to assembly, I test fit and trimmed, filed, sanded, etc. 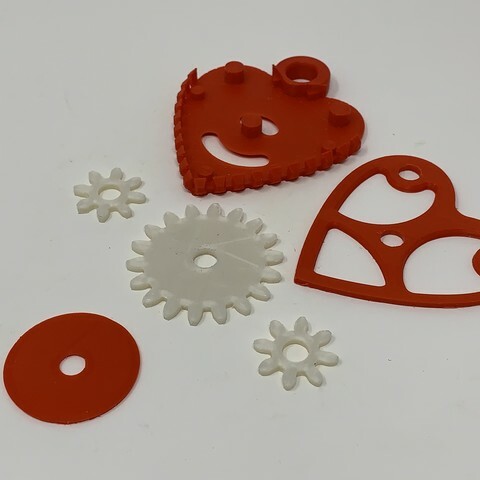 all parts as necessary for smooth movement of moving surfaces, and tight fit for non moving surfaces. 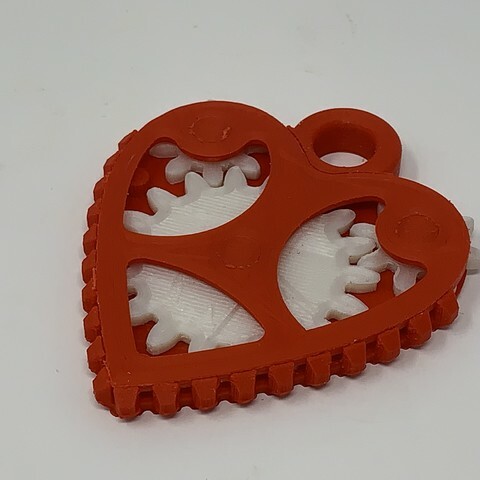 If you decide to make your own Geared Heart Message Pendant, depending on the colors you chose, your printer model and your printer settings, more or less trimming, filing and/or sanding may be required. 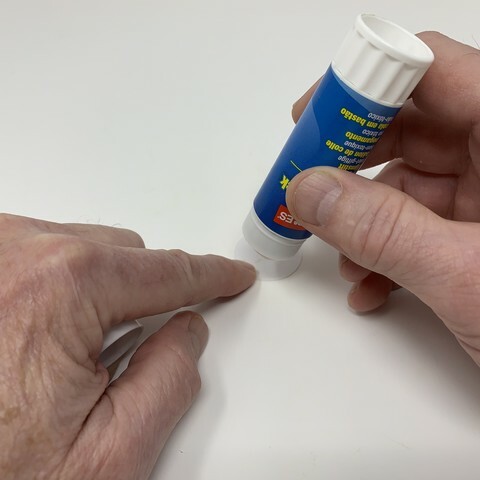 I carefully filed all edges that contacted the build plate to make absolutely certain that all build plate "ooze" was removed and that all edges were smooth. 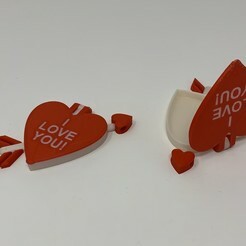 I used small jewelers files and plenty of patience to perform this step. 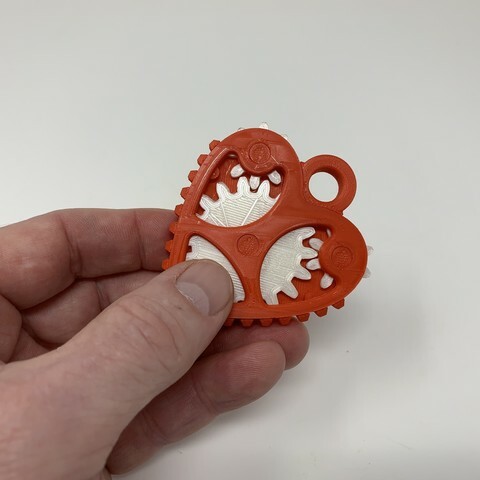 In order to avoid a dual extrusion print for the messages, I decided to 2D print them on standard copy paper, then glue the 2D printed messages to "Gear, Large.stl". 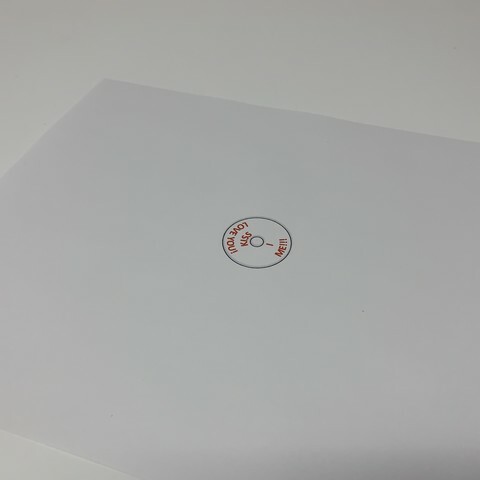 After experimenting with a few paint programs, I found that I could obtain the most accurate size and placement of the messages using (of all things) Microsoft Office 2011 Power Point. 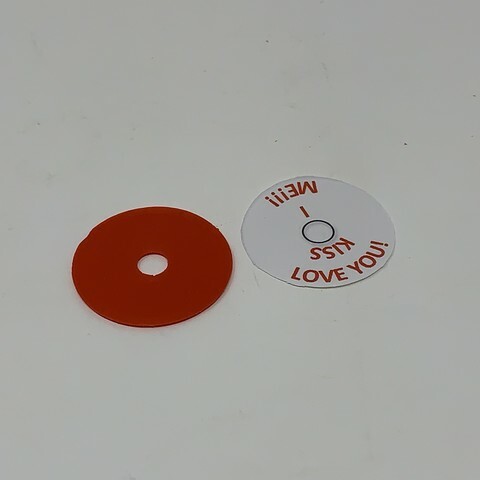 Once the design was complete, the resulting "message disk image" was saved as "KissMeILoveYou.pdf" (for those interested in creating their own message disk images, the message text is centered on two diameters, the outside being 25mm, and the inside being 11 mm). After saving this file, I opened it using the MacBook "Preview" application then printed it on a laser printer at 100% scale (I could have printed the message disk image directly from Power Point, but I needed to test the accuracy of the .PDF file conversion and printing, since I was quite certain no one but me still uses Microsoft Office 2011 Power Point). 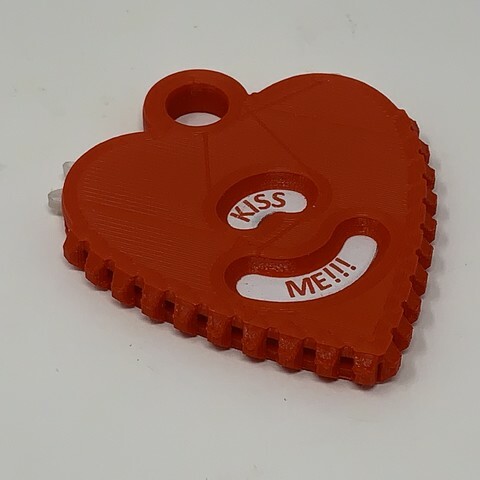 After printing KissMeILoveYou.pdf, I positioned "Cutout Disk.stl" in the exact center of the message disk image on the print then used a sharp modeling knife to carefully cut the message disk image from the print using the cutout disk as a guide. 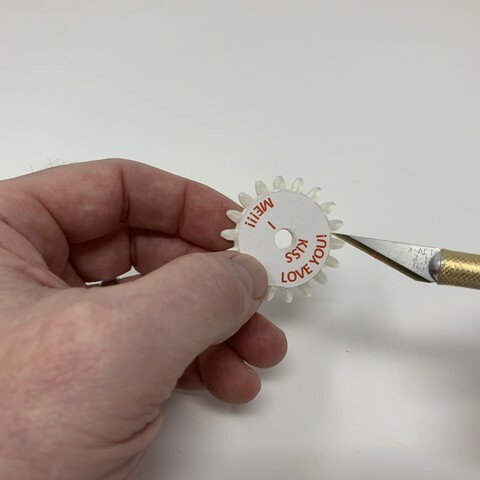 After cutting out the message disk image, I applied glue (I used a glue stick) to the back side of the message disk image and pressed it onto the center of "Gear, Large.stl" holding it in place for a few moments to allow the glue to set. 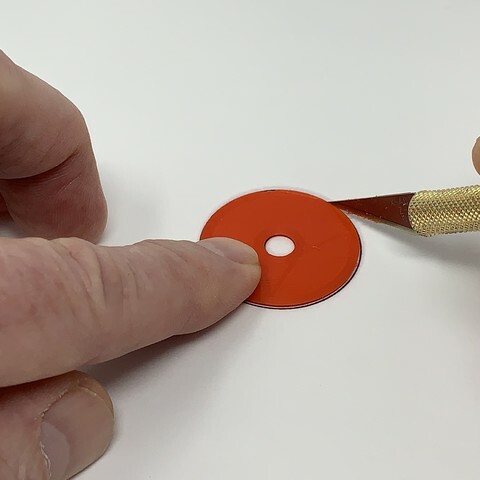 After the glue set, I removed the center hole from the message disk image using a sharp modeling knife. 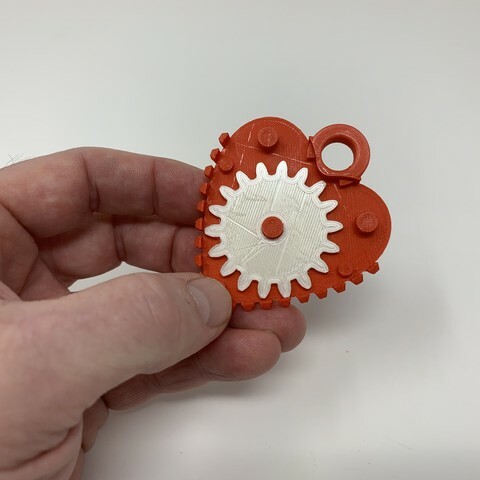 I began assembly of my Geared Heart Message Pendant by placing the large gear assembly on the center pin in "Case, Front.stl", message disk side down. 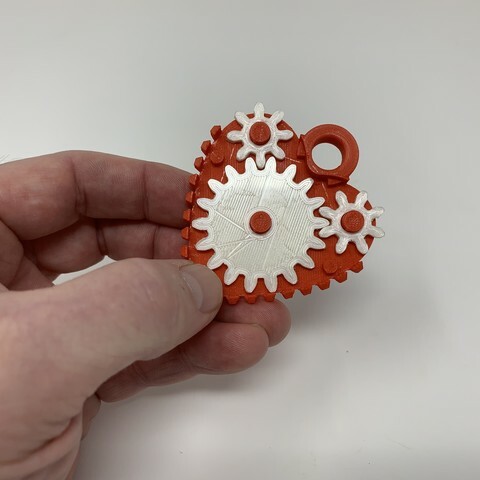 Next, I placed "Gear Small 1.stl" on the upper left hand pin on the case, followed by "Gear Small 2.stl" on the upper right hand pin on the case. 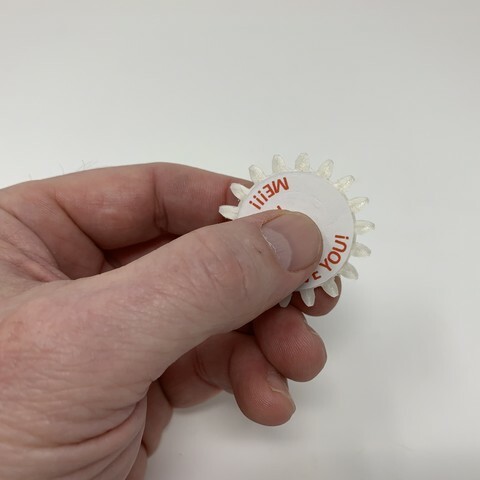 At this point I tested the mechanism to make sure it operated freely. 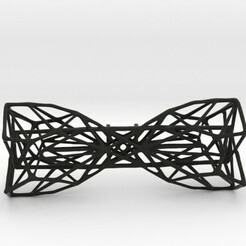 Finally, I snapped "Case, Rear.stl" onto the assembly. 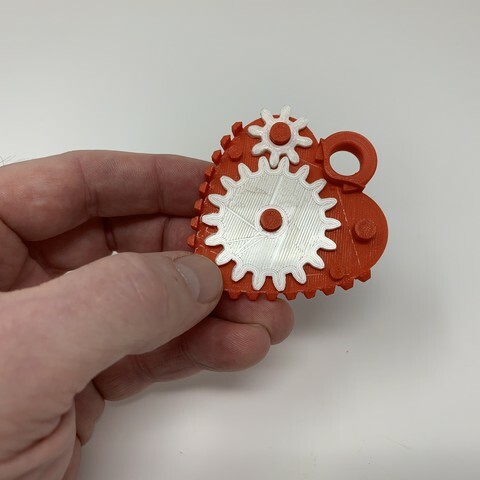 Once assembled, rotate either of the small gears to change the message. 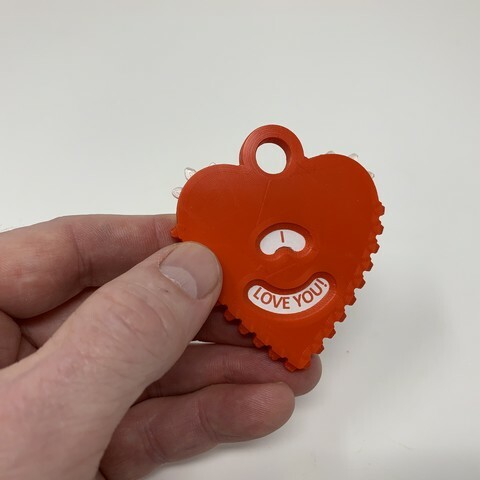 And that is how I printed and assembled my Geared Heart Message Pendants.